Left ventricular hypertrophy(LVH) is an important mechanism of cardiovascular disease in CKD that contributes to cardiac events and death. Prevalence of LVH in dialysis population is around 90% and 50-70% in CKD population. Compensatory increases in FGF23 levels help patients with CKD to maintain normal serum phosphate levels, despite even severely reduced renal function. Recent prospective studies of CKD and non-CKD patients demonstrated a dose-dependent association between elevated FGF23 levels and greater risks of major cardiovascular events and mortality. A recent study by Faul et al in JCI show the toxicity of elevated FGF-23 levels on LVH in a mice model. 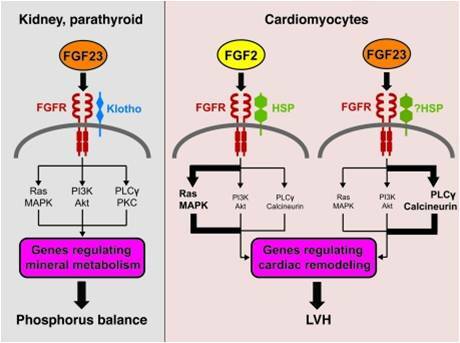 They summarize that FGF23 causes pathological cardiac hypertrophy directly. This is mediated by FGFR-dependent activation of the calcineurin-NFAT signaling cascade but do not require klotho as coreceptor. Blocking FGFR signaling can prevent LVH, independent of blood pressure in an established animal model of CKD that is characterized by elevated FGF23 levels, severe hypertension, and LVH. The effect is Klotho independent. 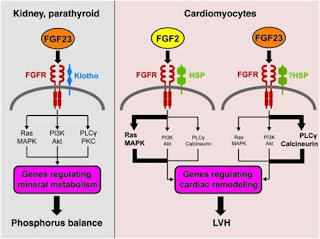 First, low-affinity binding of FGF23 to FGFR may be adequate to induce LVH when there is a protracted period of cardiac exposure to high concentrations of FGF23, such as in CKD. FGF23 toxicity : accentuated further in CKD where klotho expression is down-regulated in the kidney and parathyroid glands, which could enhance promiscuous binding of FGF23 to FGFR in other tissues. Thus, high circulating FGF23 concentrations combined with decreased klotho expression could represent an especially cardio-toxic blend in patients with CKD. 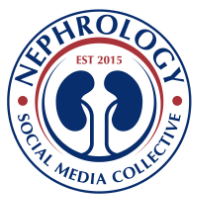 TOPIC DISCUSSION: Lithium and timing of dialysis?